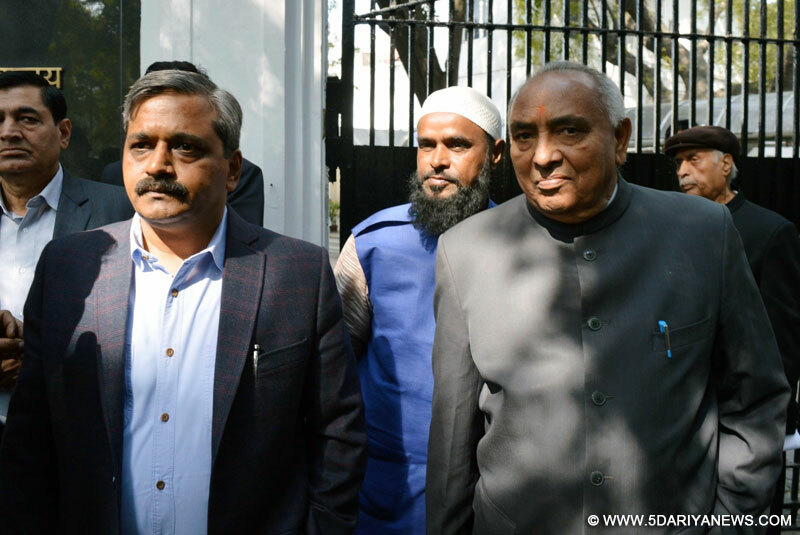 A BJP delegation led by Delhi party chief Satish Upadhyay meets Lieutenant Governor Najeeb Jung over the non-payment of dues of employees of three civic bodies in New Delhi on Feb 2, 2016. A delegation comprising three mayors of civic corporations and Delhi BJP leaders on Tuesday called on Lt. Governor Najeeb Jung for his intervention in the ongoing tussle between the Delhi government and striking civic employees. "The delegation urged the Lt. Governor to order Delhi government for release of pending municipal funds in order to end the prevailing logjam," Delhi state Bharatiya Janata Party chief Satish Upadhyay, who led the delegation, told reporters after the meeting.The BJP is the ruling party at all the three municipal corporations of East Delhi, North Delhi and South Delhi.Upadhyay also lamented that the Aam Aadmi Party (AAP) government was resorting to cheap gimmicks for political gains. "Delhi government led by Aam Aadmi Party is free to victimise the civic bodies' leaders but it should release the funds for employees who have not been able to pay the school fees of their wards and buy medicine for the ill," said Upadhyay. He blamed Chief Minister Arvind Kejriwal for pushing the national capital towards a state of emergency as the government is becoming a party to law and order problems engulfing the city. "We can fight it out in elections next year, but CM saheb please be humanitarian. Don't drive Delhi towards an emergency. Please release funds," he said.The BJP also condemned city's Health Minister Satyendar Jain for using abusive language against the civic bodies' engineering staff, who on Tuesday marched from the City Centre to Rajghat, holding bowls to beg for release of their salaries.Upadhyay said the minister should not stoop so low when dealing with the state employees.